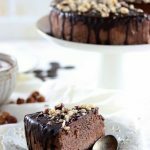 The easiest way to make a Ketofied version of traditional Canadian Maple Fudge without any sugar! 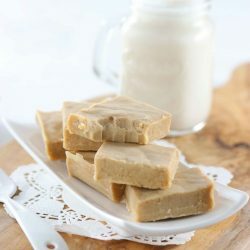 Maple fudge, aka Sucre à la Crème in French, is a delicacy in the French part of Canada, Quebec. We make this fudge during the holidays and we usually serve it during Christmas. It’s usually a mixture of sugar and butter cooked with cream added at the end to make it like fudge. I’m not entirely sure where it came from, but we sell it everywhere in Quebec as it’s a traditional treat. 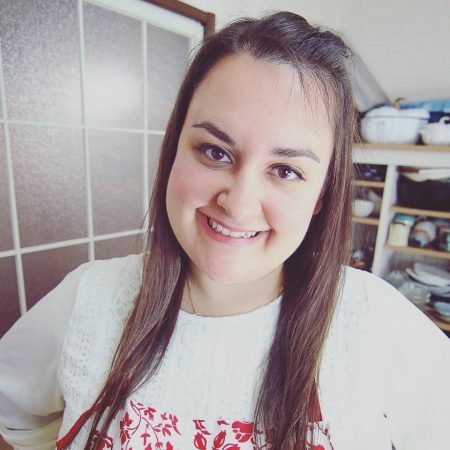 When I went home for the holidays, I saw it everywhere in the stores and really wanted to eat some so I decided that when I would come back home to Japan, I would figure out how to make sugar free maple fudge and enjoy it! 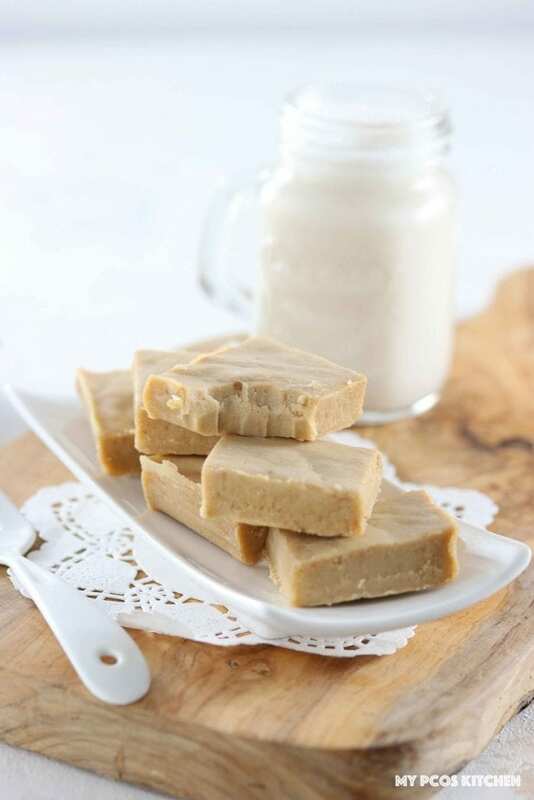 This maple fudge recipe was actually inspired by my Sugar Free Caramel Sauce. When the sauce solidifies in the fridge, it really tasted like maple fudge but was lacking the softness and a bit of maple flavouring. I decided to take my recipe for the caramel sauce and add more cream to make it softer and add some maple flavouring to it. It turned out even better than I hoped. In order for the caramel to not crystallize when refrigerated, or break when reheated, you would normally need to add some sort of real sugar to it. Most recipes call for black strap molasses or fiber syrup that’s made with high GI sweeteners, but I really wanted to avoid using sweeteners other than stevia, monk fruit and erythritol so I figured out a recipe that worked using the erythritol and monk fruit liquid sweetener from Lakanto. The liquid from Lakanto is actually sold clear in colour in Japan, but in America, it’s sold brown in colour. They both have the same ingredients and are from the same companies, but for some reason have different colours. Also, the addition of xanthan gum ensured that the oil and milk solids did not separated when heated or cooled. It also helped the caramel thicken up quite a bit. I prefer to use powdered erythritol in my recipes because it doesn’t crystallize as much when cooked or cooled. 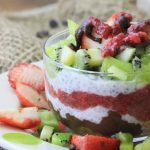 You can make your own by simply adding erythritol to a blender and blending for 30 seconds or so. It will create a fine powder that you can use as confectioner’s sugar. If not, you can buy erythritol powder online or in stores. I added a bit of maple flavouring that I got at a baking store so that it would taste like maple syrup, but that is totally optional. If you can’t find it anywhere, just leave it out. The caramel itself already tastes kind of like maple, but the flavouring enhanced the flavours immensely. This fudge reminded me of home so much, it was soft and creamy just like the real deal. I recommend this sugar free maple fudge to anyone who wants to experience a traditional treat from Quebec, my home town! Even though it’s not Christmas anymore, you can still make these any time of the year and have them as a treat! Valentine’s Day is coming up, so you could even make this for your partner! 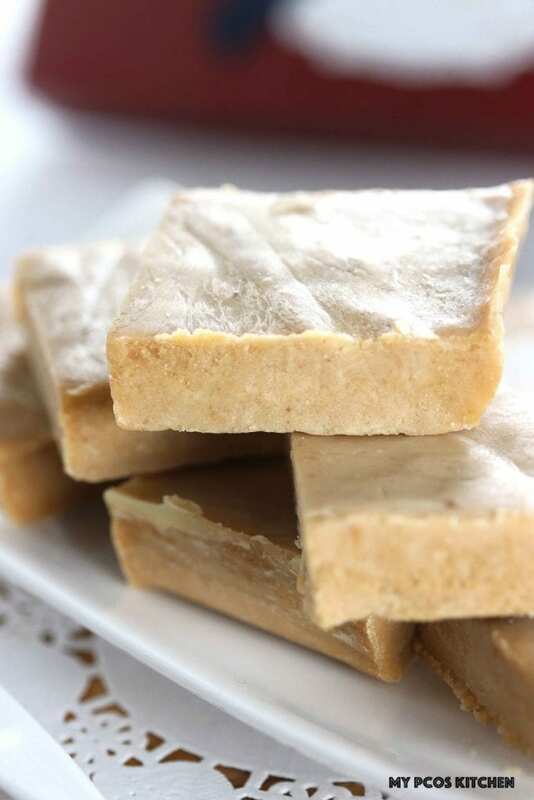 I’m personally making my Low Carb Matcha Fudge for my darling and making this maple fudge for myself HAAHAHA. A traditional treat from Quebec that is soft and creamy with a delicious maple flavour! Read all of the instructions before making this sauce and have all of the ingredients ready on hand! In a non-stick small pot, add the water, powdered erythritol, and lakanto syrup. Put on medium heat and simmer until the water starts to boil. I use a gas burner, so my heat was definitely higher. Add the butter and start whisking with a whisk, still on medium heat, for a good 6-10 minutes until the liquid starts to become brown. First the butter will bubble like crazy and after a good 5 minutes, it will stop bubbling. Then it will start to smoke and then within 1 minute, the butter will brown. The butter NEEDS TO BROWN, this is the "burning" process for caramel. If it doesn't brown, your caramel will not work, so keep on heating, even turn up the heat if you have to, until it starts to smoke and the burn/change colour. Once the color changes, turn off the heat immediately and pour the cream in. Once your pour the cream in, the pot will bubble like crazy, just make sure you continue to stir. The caramel will be very light in colour. Sprinkle in the xanthan gum, and pour in the maple flavouring. Turn the heat back on to medium-high, and continue whisking vigorously for a good 1-3 minutes. The sauce will start to thicken even more and get more brown in colour. Once the sauce is the desired thickness and colour, turn off the heat. Pour the caramel into a baking pan lined with parchment paper and spread evenly. Place the pan into the fridge to cool for minimum 5 hours. Once chilled, cut the caramel into 15 squares and they are ready to enjoy!!! Keep the fudge in the fridge. It's good in the fridge for about 2 weeks, but they'll probably be gone before that! Just wonder if the brand Nature’s Hollow sugar free maple syrup would work? Hi Heather, I’m not sure as I’ve never used it and it’s not available where I live. I made this and followed directions & notes – used longer cooking times and added 1/2 TBL more maple extract but it would not set in the fridge. I put it in the freezer to “harden” but it took over 12 hours total between the 5-6 in the fridge then the rest in the freezer before it wasn’t a sticky mess under a firmer skin on top. Also very chemically taste – I used Swerve for the erithrytol and still not maple enough for me. 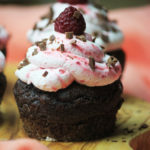 Will the recipe work if I use butter flavored coconut oil (instead of butter) and coconut cream (instead of heavy cream)? My husband is allergic to dairy. Thank you. Hi Ann, I’m not really sure as I haven’t tried it with those substitutes. Do let me know if it works though! Super bon, really good, and guilt free! As a Canadian, Maple will always have my heart! This fudge looks delicious, and I’m totally with you, I’d go for the maple, even if I made the matcha for my husband! Yum!!! 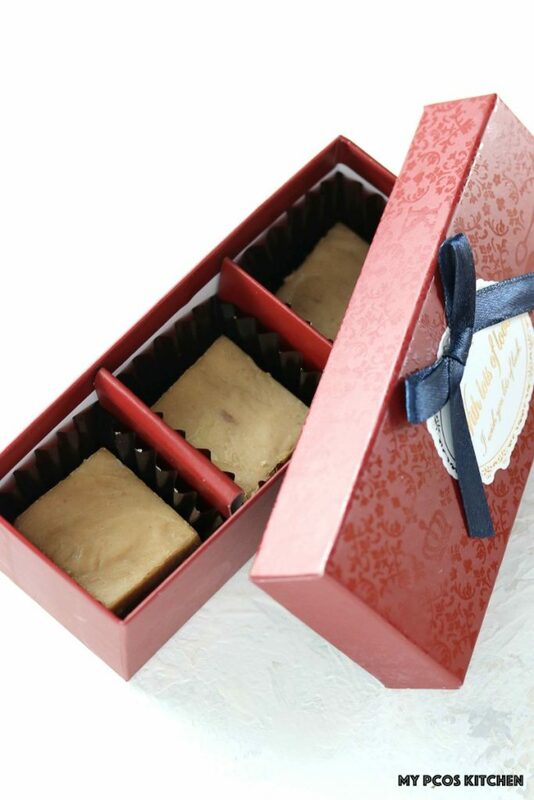 Maple fudge sounds so delicious! I haven’t tried Lakanto’s syrup yet, I’ve only used their classic granulated. I’ll have to check that out. Homemade fudge is one of my favourite treats! So easy to make, so delicious! Looks delicious! I am from Ontario and I know people in Canada are crazy about Maple anything! Wow, this is such a fun variation on the original. I can’t imagine my blood sugar liking how much maple syrup goes into the original fudge recipe! Thanks for this!! I love the Lakanto syrup on pancakes, but this fudge recipe just takes it to the next level. I can’t wait to try this treat! Looks so decadent and delicious! Love that these are low carb. I have been wanting to try the lakanto syrup….maybe I will finally pick some up!! This looks dreamy! We had maple fudge in Vermont! So good! Vermont is just beside my house! Like 20 min drive once you cross the border! 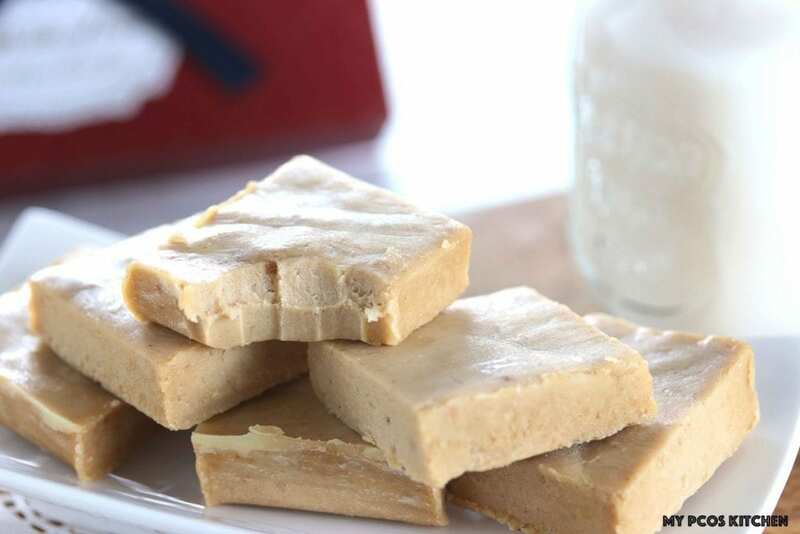 I’ve never made fudge but this recipe makes me want to try!